Voted Best Preschool 2018, Loma Linda Academy Children’s Center provides early childhood care and education as one of four campuses of Loma Linda Academy and is licensed by the State of California Department of Social Services. Our fundamental commitment to Christian values is deeply rooted in our mission to provide a nurturing environment for children. We support a community of students, staff, and parents who love God and reflect His character by serving with passion and excellence. We strive to maintain a safe and loving environment with the physical, social, spiritual, emotional, and intellectual development of young children in mind. Our teachers are caring and committed to helping your child develop foundational skills. We focus on developmental milestones, learning styles, and educational needs to help ensure that each child receives hands-on, one-on-one attention. We offer a range of vegetarian snacks that are prepared fresh daily. We also offer a vegetarian hot lunch program. Lunch tickets are available in the front office for purchase. Playing outside is an important part of childhood development. Our outdoor space not only helps support what children are learning in the classroom, but it also is a great place to play! In addition to our playground equipment we have an outdoor chapel area, spaces for sensory experiences with sand and water, garden boxes, and even some barnyard animals. We are currently full. However, if you would like to be placed on our waiting list, visit www.lla.org/childrenscenter to download the waiting list form. Bring your completed form to our office along with a $20 (non-refundable) fee. Do we need to be Seventh-day Adventist to attend? No! We welcome families of all religious traditions and strive to create a safe space for all students to learn. We encourage our students to make good moral decisions regardless of their creed or belief system. Christian beliefs and values are presented in a positive way in all classes and activities. Yes! We are licensed by the State of California Department of Social Services. If you would like to be placed on our waiting list, you can print the form below and bring it to Loma Linda Academy Children's Center along with the $20 non-refundable fee. We are pleased to provide the following to our program. Classrooms are fitted with: an aquarium, art tables, bulletin boards, changing tables, circle time area, computer station, cubbies, eating area, learning centers, manipulatives, potty training facilities, reading center, science table. Outdoor play areas are equipped with: fall zone material, playground equipment, picnic tables, sandbox, garden area. 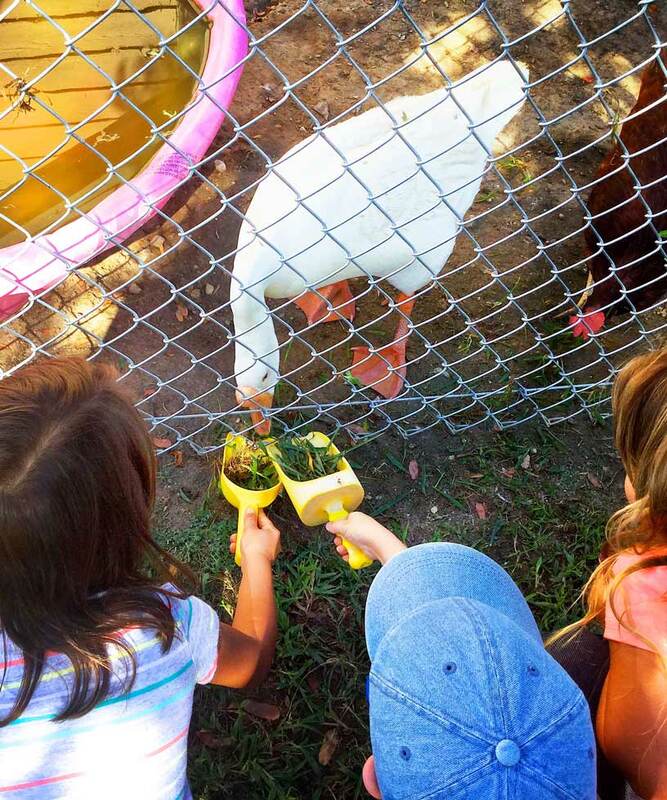 We have a variety of animals including: rabbits, chicken, geese, turtles and fish. This program emphasizes meeting the needs of the individual child ages 3 months to 24 months. Nurturing, loving, stimulating, and responsible care is provided. The staff works with the parents to develop an optimum schedule for the child. Toys and materials are provided to challenge, promote discovery, open up exploration, and bring about the development of new skills. A 1:4 teacher-child ratio makes careful observation and charting possible. For preschoolers, ages 2 through 4 years old, the program emphasizes age-appropriate activities and experiences that will enhance spiritual, physical, emotional, intellectual, and social development. We strive to help each child develop a healthy self-concept. Every child's creativity and individuality are encouraged and respected. The classrooms are staffed with a 1:8 teacher-child ratio, making teaching within quality care possible. While there's no perfect formula that determines when children are truly ready for kindergarten, here is a checklist to see how many skills your child will work towards mastering in our pre-k room: count to ten; cut with scissors; trace basic shapes; speak understandably; identify some alphabet letters; recognize rhyming sounds; listen to stories without interrupting; button shirts, pants, coats and zip up zippers; sort similar objects by color, size and shape; look at pictures and then tell stories; understand actions have both causes and effects; and recognize groups of one, two, three, four, and five objects. The pre-k teachers want to encourage children to be independent, capable, and have an eagerness to learn. This room has a 1:12 teacher-child ratio. The daily schedule begins with worship, there is indoor and outdoor playtime, teacher-directed learning, art, music, learning centers, creative experiences and story times. Each room develops its own curriculum based on the child's individual needs. We are excited to offer our athletic program available to children 2-4 yrs. The children are instructed in a non-competitive environment on several popular sports. They learn the importance of practice and preparation. They also learn lessons in teamwork, sportsmanship, patience and perseverance. All snacks and meals served are vegetarian. We offer a hot lunch program, at an additional charge, prepared fresh daily by a local chef. The children enjoy a healthy variety of lunch items. Creation Kids is a faith-based curriculum for our older threes through Pre-K. This comprehensive, self-contained, digital curriculum promotes the development of the whole child’s—head, hand, and heart. It provides a framework for the day’s events that supports children’s security and independence by following a consistent routine day after day. It gives children the sense of security they need to make choices and take risks, which opens the door to exciting learning opportunities. We supplement this curriculum with HighScope and Zoo-Phonics as well. LLACC also uses the HighScope Program. The HighScope Curriculum emphasizes adult-child interaction, a carefully designed learning environment, and a plan-do-review process that strengthens initiative and self-reliance in children and young people. Teachers and students are active partners in shaping the educational experience. The HighScope Curriculum integrates all aspects of child and youth development. Using research-validated strategies, this approach enhances each young person's growth in the foundations of academics as well as in social-emotional, physical, and creative areas. The Infant-Toddler Curriculum is based on the principle that children learn best through direct, hands-on experiences with people, objects, events, and ideas. During this active learning process, infants and toddlers are encouraged to discover the world around them by exploring and playing. Learning and development are anchored by long-term, trusting relationships with caregivers, who are close at hand to support the children as they play. Adults scaffold further learning as they interact with children throughout the day. The space and materials in HighScope infant-toddler settings are arranged to promote active learning within a safe, comfortable and secure environment. Each center is divided into areas organized around specific kinds of play and care, such as small toy area, book area, movement area, art area and spaces for diapering, meals, and naps. The areas are located around the perimeter of the room and the middle space is used for large-muscle movement. HighScope teachers give children a sense of control over the events of the day by planning a predictable yet flexible daily routine. The routine consists of arrivals and departures, choice times, group times, meals, and outside times. These common daily events are scheduled to accommodate the eating, sleeping, and bodily care cycles of each infant or toddler. The Infant-Toddler Child Observation Record (COR) enables caregivers and administrators to assess each child's progress and plan educational experiences that will encourage further learning. This assessment is designed to coordinate with the HighScope Preschool COR. In cases where programs serve a mixed age group, both instruments are used. In HighScope's vision of preschool education, children are doers and problem solvers, and adults are partners who share in children’s discoveries and gently guide their learning. The HighScope Preschool Curriculum is built around 58 developmental milestones called Key Developmental Indicators (KDIs) in 8 curriculum content areas that are closely aligned with state and professional standards. The KDIs define what we teach; the hows are provided by our teaching practices for the classroom learning environment, daily routine,and adult-child interaction. Teachers set the stage for learning through a carefully planned physical environment and consistent daily routine. Within this structure, children are secure and self-reliant learners. The centerpiece of the day is HighScope's unique plan-do-review process, in which each child has a daily opportunity to make and carry out a plan and then reflect on what happened. This process strengthens the child's executive function — their ability to regulate and organize themselves so they can stay focused on what they have chosen to do and solve problems that arise. LLACC ALSO INCORPORATES ZOO-PHONICS IN OUR CURRICULUM. Zoo-phonics teaches the sounds of the letters through the animal names ("a" as in Allie Alligator, etc. ), and letter sounds are taught before letter names. Zoo-phonics teaches lowercase letters before capital letters. After all, reading materials are written 95% of the time in lowercase letters. Please open each form and print. This is your registration packet that you will need to submit with your registration fee. Program Director: Julie Majestic M.Ed.